Desander is a very important part when using machines to separate solids and liquids, and widely used in oilfield and hdd and mining projects. Here is the detailed information, the definition, and the desander’s use, especially in oilfield, then I will recommend the GN ZQJ series desander. When referring the desander, hydrocyclones are very urgent to come to the stage. Hydrocyclones is also called cyclone separator.Hydrocyclones are drilling rig equipments with a set of hydrocyclones that separates sand and silt from the drilling fluid. Desander is installed after shakers and degasser but before desilter. It removes those abrassive solids from the drilling mud which cannot be removed by shakers. 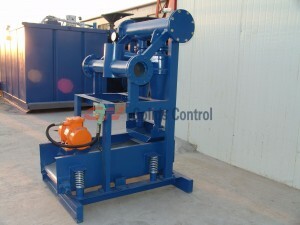 a centrifugal device for removing sand from drilling fluid to prevent pump abrasion. Desander is widely used in various field, the one we always know is in oil and gas drilling, to separate the drilling cuttings, in oilfield it is one part of solids control system, just after the shale shaker, you can get the detailed information of solids control system here, and then is the most important part, and the enviorment friendly phase, to deal with the used drilling fluids. Another one is some likely with the oil and gas field, it is drilling work, HDD&UNDERGROUND—-Mud Recycling System. ZQJ300S desander is the largest in GN ZQJ series desander, its treating capacity is 240m3/h(equal to 1056GPM), it adopts 1~2pcs 12″ cone, 12″ cone =120m3/h, it means that if you choose one 12″ cone, the treating capacity of the desander is 120m3/h, if you choose 2pcs 12″ cone, the treating capacity is 240m3/h. It can be customized. It can separate 47~76 μm particles, the screen area is 1.0m2. If there is no “S” in the model No., it means no under fluids shaker. Our Kuwait clients have bought 5 sets of desander and desilter but without under fluids shaker.